As the only meal where the entrée very well may have a higher sugar content than even the most indulgent desserts, breakfast is easily my favorite meal. This deceptively healthy treat passes as breakfast, dessert or an afternoon snack and is one of best efforts to thwart my monstrous sweet tooth. An added bonus, rhubarb is in season for a bit longer and can still be seen at very reasonable prices. Though I doubt I’ve ever seen more than the stalk of the plant available at the grocery store, be aware that the leaves are toxic. Place the water and cranberry sauce in a large saucepan over low heat. Cook, stirring occasionally, for 3 minutes or until sauce melts. Add the rhubarb, pears and cinnamon stick. Bring to a simmer and cook, covered, for 5 minutes. Uncover and cook for a further 5 minutes or until fruit is tender and liquid thickens slightly. Remove from heat and set aside for 15 minutes to cool. 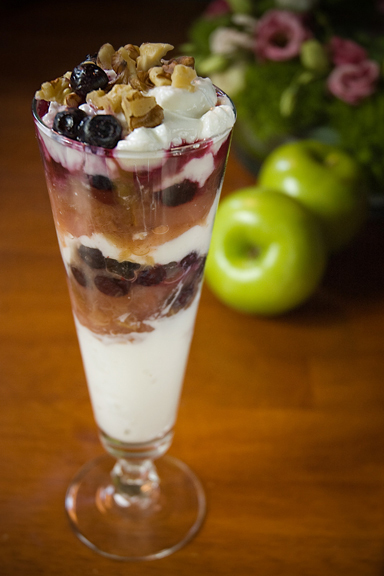 Layer yogurt, compote, blueberries, and walnuts in a serving dish. Breakfast is totally my favorite meal of the day too, and for the same reason…this looks amazing!